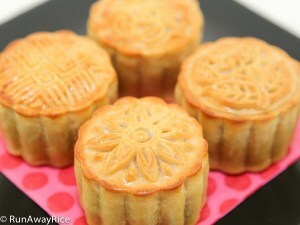 Every year when the Mid-Autumn Festival season approaches, I get giddy thinking about making mooncakes. First, I love to bake. Second, I love the artistry of making these cakes. The entire process from making the filling and dough, rolling and stamping the cakes is such a wonderfully creative process. Once done, each cake is unique and truly a work of art! 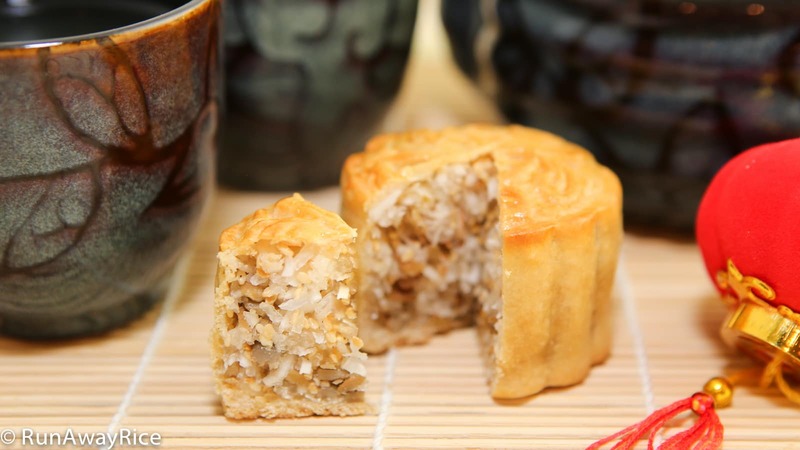 This post shares the recipe for mooncakes with a sweet filling made of shredded coconut, sunflower and sesame seeds–a classic and popular combination. My recipe is a healthier version using less oil and sugar so you can feel good about making these treats and sharing them with your family and friends. These mooncakes are so scrumptious and so much fun to make, you’ll definitely want to give this recipe a try. Happy Mooncake Making! I’ve shared other mooncake recipes in prior posts so please check them out for more tips and tricks! It’s best to use fresh or frozen coconut. If using dried coconut, add 1/4 – 1/2 cup water along with the sugar. If using raw sesame seeds, toast them in a skillet just like the sunflower seeds until they are lightly golden. The cooked glutinous rice flour is a binder and helps the filling to stick together. If you don’t have this, it’s okay. If you work with the filling while it’s warm, you shouldn’t have any problems forming the balls. If you don’t like peanut oil or have allergies, substitute with a mild-tasting vegetable oil like soybean or canola. which is meant for baking and cooking. It has a really nice distinct flavor. General rule: the filling to dough ratio is 2:1. If the dough is dry, add more peanut oil, a little bit at a time. The dough should be soft and pliable and slightly sticky. It’s best if the mooncakes are not eaten right away. Let them rest for 24 hours and the cakes will improve in color, taste and texture. After a day or two refrigerate the cakes. You can warm them up in the microwave by cooking on Low for 30 seconds. Freeze the cakes for up to 3 months. To serve, allow to thaw at room temperature and then warm in the microwave if desired. 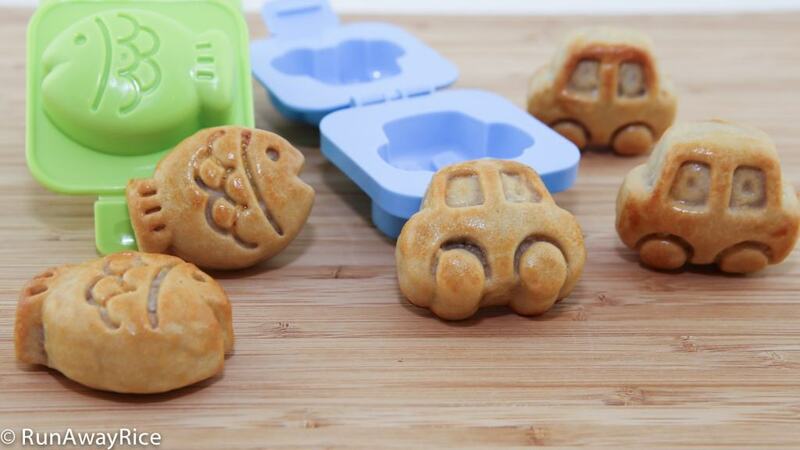 I bought these little car and fish molds at the Japanese grocery store. They are used for pressing rice balls and hard-boiled eggs into cut shapes. They are so cute and perfect for making fun mooncakes the kiddies will adore! The trick to using these molds is to coat with a generous amount of flour otherwise, it’s very difficult to remove the cake from the mold. Use a small brush to remove the excess flour before baking. 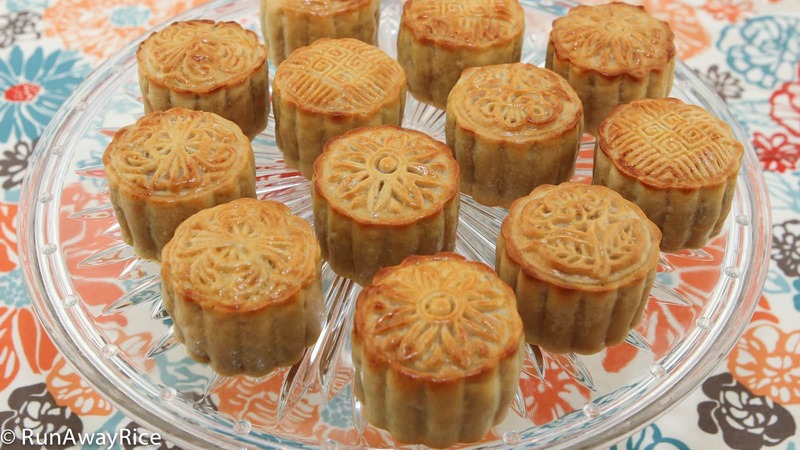 If you enjoyed this recipe, you may also like: Piggy Mooncakes for Mid-Autumn Festival (Banh Trung Thu / Banh Nuong) and Mooncakes with Sweet Red Bean Filling (Banh Trung Thu / Banh Nuong Nhan Dau Do). In a large bowl, combine the shredded coconut and sugar. Cover the bowl and let rest for 2 hours. Use scissors and cut the coconut into shorter strands. Toast the sunflower seeds in a skillet over Low heat until golden, approximately 7-8 minutes. In a large skillet over Medium Low heat, add the coconut mixture and cook for 6-7 minutes stirring frequently. Add the sunflower seeds, sesame seeds, cooked glutinous rice flour and water. Mix together combining well. Add the pomelo essence and toss together again. Remove from the heat. Use a food scale and weigh the filling for one ball. Roll into a firmly-packed ball. (See the video for my trick to making perfectly shaped balls.) Continue until all the filling is used. Sift together the all-purpose flour and cake flour. In a small bowl or cup, add the syrup, peanut oil and egg yolk. Mix together until evenly blended. Make a well in the flour and pour in the syrup mixture. (Be sure to scrape out all the syrup from the measuring cup.) Using a fork, combine the flour and syrup mixture together by stirring in circles from the edge of the bowl to the center. Continue stirring until all the dry flour is worked into the dough. After a few minutes, a soft dough forms. Gently knead the dough a few times with your hands. (Don’t overwork the dough.) Wrap in plastic wrap and allow to rest for 30 minutes. Line a baking tray with a Silpat Non-Stick Baking Mat or parchment paper. Sprinkle some flour on your work surface and knead the dough gently for 1-2 minutes. Cover with plastic wrap so the dough doesn’t dry out. 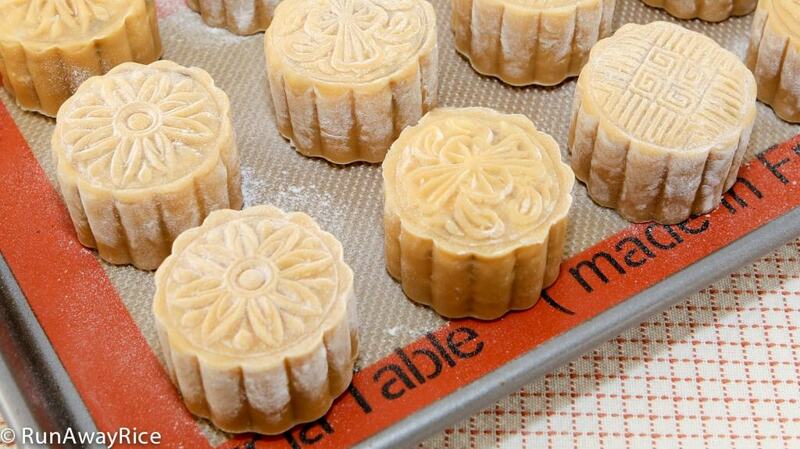 Assemble the mooncake mold with the desired plate and then coat with flour. Tap the mold to remove the excess flour. Use a food scale and weigh the dough needed for one cake. Roll the dough into a ball. Using a rolling pin, flatten into a 3-inch circle. Place a filling ball in the center and then gently work the dough around the filling covering it completely. Pinch the dough together to seal the edges. Roll between your palms until smooth. Place the ball in the mold. Pressing gently, work the ball down and into the mold. Use your palm and fingers to press the cake evenly into the mold. Prick a few holes in the cake using a toothpick to allow the steam to escape when baking. Place the mold down on the work surface. Press down on the plunger for a few seconds. Lift the mold off the work surface and then push down on the plunger to release the cake. Transfer the cakes to the baking tray. Continue until all cakes are made. Use a small pastry brush to remove the excess flour from the cakes. Position the oven rack in the middle of the oven. Preheat the oven to 375 degrees F.
Bake the cakes at 375 degrees Fahrenheit for 10 minutes. Remove cakes from oven and allow to cool for 5 minutes. Spritz each cake with water. To make the egg wash, combine egg yolk, water and sesame oil. Strain the mixture. Brush each cake with the egg wash, coating it evenly. Increase the oven temperature to 425 degrees Fahrenheit. Return the cakes to oven and bake for 7-8 minutes or until the tops are just golden. Remove from the oven and allow to cool. Store in an air-tight container. What can I replace for pomelo essence? Or can I leave that out? Vanilla extract or jasmine essence are good substitutes. Otherwise, you can omit the pomelo essence. Instead of an egg wash, you can use milk, cream or butter. Optionally, use a wash made of table sugar, honey or light syrup. Good Luck!